This year’s race to the White House has been billed as a thing of historic proportions, and in terms of who will end up in the Oval Office, it certainly is. But when it comes to foreign policy, judging by last Friday’s presidential debate in Ole Miss, it seems that voters won’t have much of an actual choice. Not only did the two presidential candidates fail to advance any new foreign policy ideas, but in many respects they seem to share a similar vision of America’s position in the world. Like most members of the U.S. foreign policy establishment, both Sen. John McCain (R-AZ) and Sen. Barack Obama (D-IL) want Washington to continue pursuing an interventionist foreign policy, based on their shared definition of U.S. national interests. Both believe that the United States is obligated to continue serving as the so-called hegemon of last resort in the international system and to ensure that no regional or global player—Iran in the Middle East; Russia in the Caucasus and Europe—challenges this dominant U.S. position worldwide. Though the ends are the same, the means are different; Obama would prefer to achieve this ambitious task through diplomatic means, while McCain is more inclined to flex American military muscle. But tellingly, at a time when the U.S. economy is facing what could become a devastating crisis, neither candidate explained how the country could continue to embrace such costly foreign policy goals while relying on the resources of foreign players—including the financial institutions of China, Japan, South Korea, and oil states in the Persian Gulf, and even Russia—to finance America’s expanding current-account deficit. The candidates’ lack of answers to this significant question was perhaps one of the most important take-away points to observers listening closely for hints about a future U.S. foreign policy. Moderator Jim Lehrer provided the debaters with ample opportunity to explain their prescriptions for resolving the U.S. financial crisis before he moved the talk on to “pure” foreign policy and national security issues, the designated topics of the first debate. 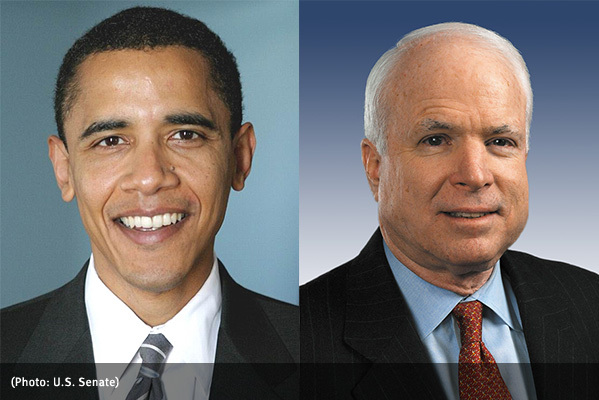 Both McCain and Obama merely reiterated their support for the negotiations over the Bush administration’s proposed (and now rejected) $700 billion plan to bailout out U.S. financial institutions. Obama stressed that he supported more “oversight”; McCain stressed the need for Americans to reduce dependence on “foreign oil.” Each candidate had a line of the day: Obama blamed deregulation for the crisis, and McCain bashed congressional earmarks. But Obama, an early critic of the Iraq War, tied ballooning defense spending in Iraq to the growing government and current-account deficits, suggesting that ending the war would help put America’s financial house in order. Neither candidate, however, used the opportunity to flesh out how their economic visions corresponded with their broader views of America’s role in the world. When Lehrer asked what lessons the two candidates had drawn from the U.S. experience in Iraq, McCain repeated his argument that the “surge” had proved enormously successful and added that America is winning in Iraq; Obama said that Iraq is a diversion from the struggle against terrorism and emphasized again the costs of the war. There was nothing new in either of these arguments, and by this point in the debate it was fast becoming clear that viewers and listeners hoping for new thoughts or fresh insights on foreign policy were in for disappointment. McCain’s debate-mode modus operandi was to challenge Obama’s foreign policy credentials and stress several times that his competitor “didn’t understand” national security issues. But Obama responded strongly with the memorable line that McCain had been “wrong” again and again on Iraq when he said that we knew where the WMD were hidden and that we’d be greeted as liberators. Obama argued that McCain sounded as if he thought the Iraq War started after the “surge”; McCain suggested that the important issue was not the history of the Iraq War but the current handling of the situation there. While some viewers may have given either candidate more style points for delivery, there was again little new or insightful from either on this issue. The candidates also failed to provide fresh perspectives on the increasingly problematic situations in Afghanistan and Pakistan, repeating the same bickering back-and-forth they have engaged in outside the debate. On Iran and its nuclear ambitions, viewers witnessed the predictable agreement that, yes, Israel is a valuable U.S. ally, and, yes, should Iran go nuclear, it would be an unacceptable threat. Both candidates sought to assure viewers of their allegiance to Israel. McCain invoked the language of the Holocaust and criticized Obama’s willingness to talk to Iran; Obama blamed Bush administration policies for strengthening Iran and noted that McCain’s foreign policy advisor Henry Kissinger advocated diplomatic dialogue. The post-debate conventional assessment is that the debate was something of a draw. But what was hinted at in the debate (with Lehrer’s urgent digressions into financial territory) and is clear in recent polls is that the state of the economy has become Americans’ top priority this election season. The Iraq War, relations with Iran, the resurgence of Russia—all these important subjects have been pushed to the background by the more immediate threats to voters’ finances. With foreign policy closer to the bottom of the public’s agenda, and with the complete lack of new ideas presented during the first debate, significant changes to the course of U.S. foreign policy in any new administration seem unlikely.